This velvety-smooth soup may look as though it’s from a fine dining restaurant, but it is oh-so-easy to prepare. 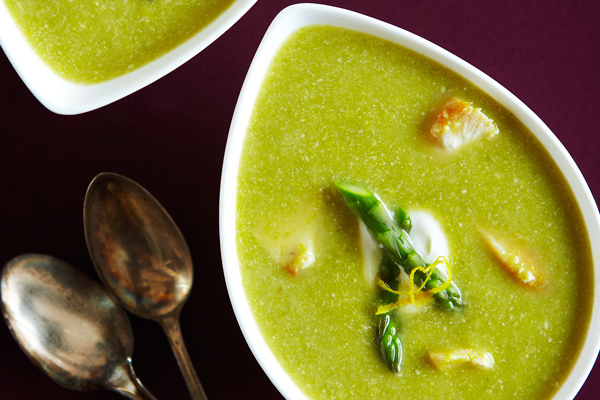 The mouthwatering combination of chicken, asparagus, and Asiago cheese makes for a soup with intense depth of flavour that will earn it a regular space in your recipe box. Heat oil in soup pot over medium heat. Add the diced onion and cook until the onion softens, stirring often. Pour in chicken broth, white wine, cayenne, nutmeg and lemon zest. Cover and simmer for 10 minutes. Cut the tough bottom off the asparagus. Trim tips off other end and set aside for use later. Add chopped asparagus, cut into 1” (2.5 cm) pieces, to the pot. Simmer 5-8 minutes until tender but still bright green. Puree the soup with a blender until smooth and creamy. Stir in half the sour cream. Add the chopped chicken to the pot with both of the grated cheeses and heat gently for a few minutes until hot. Season with salt. Garnish with fresh mint. To serve, mix the rest of the sour cream with the milk and swirl artfully around the top of each bowl. Garnish each bowl with asparagus tips and a sprig of fresh mint.